After decades of distance, China is moving closer to the region's sectarian feuds — and its vital oil reserves. At the start of 2016, prospects weren't good for what would later become one of Chinese President Xi Jinping's most consequential international tours. The January execution of leading Shite cleric Sheikh Nimr al-Nimr, the voice of Saudi Arabia's Shiite minority, and the subsequent severing of diplomatic relations between several Sunni countries and Shiite Iran came at a particularly inconvenient time for Xi. His planned maiden trip to the Middle East was to include stops in Egypt, Saudi Arabia, and the United Arab Emirates, all majority Sunni countries. Visiting Sunni leaders at a time of great tension with Shiite Iran would have created the impression that China supported one of the two major branches of Islam over the other, undermining Beijing's long held policy of staunch neutrality in the Middle East. But postponing the visit for a second time in less than a year would have had consequences too. China had already called off a similar trip scheduled for spring 2015, after a Saudi-led coalition of Sunni states launched a military campaign in Yemen against the Houthis, an Iran-backed Shiite group. Since becoming president, Xi has visited almost every region of the world — but not the Middle East. The same is true for Premier Li Keqiang. Another delay would have signaled that regional spoilers could easily interfere with China's foreign policy. Instead, Xi decided to use the crisis in the Muslim world as an opportunity to raise the curtain on China's new Middle East strategy, one that finally involves China getting off the sidelines and plunging into the Middle East's stormy waters. China is no longer willing to sit on the sidelines and watch the region descend into chaos. It has been a busy few weeks for Beijing's Middle East policy. In the past several weeks, even before the al-Nimr execution, Xi has sought ways for China to inject itself into the Syrian crisis, inviting both Syrian Foreign Minister Walid al-Moallem and the head of the opposition group, the Syrian National Coalition (SNC), to high-level meetings in Beijing in an effort to promote peaceful resolution. Significantly, this meant departure from China's long-held policy of supporting Bashar al-Assad. On Jan. 13, Beijing released its Arab Policy Paper, a vague but seminal document articulating China's interests in the Middle East. After the ransacking of the Saudi embassy in Tehran, Xi dispatched his Deputy Foreign Minister Zhang Ming to both Tehran and Riyadh, urging the sides to exercise calm. Xi also rearranged his travel itinerary, replacing his planned visit to the UAE with an unexpected stop in Tehran, thus becoming the first foreign leader to set foot in Iran since the lifting of the sanctions. For balance, he brought the Saudis a consolation gift: a declaration of support for the sovereignty of Yemen's government, whom the Saudis support in the war against Iran's proxy. Such diplomatic hyper-activity may surprise those accustomed to China's tendency to avoid interventionism. Cynics may say that these are all tactical moves designed to secure prime business opportunities for China on both sides. There may be some truth to this. But it would be a mistake to reduce China's latest action to pure economic opportunism. Chinese President Xi Jinping with Saudi King Salman on January 19. More importantly, Russia has laid down the flag of Middle East neutrality that it carried for most of the post-Soviet era. Moscow once enjoyed equally good relations with Tehran and Riyadh. But in plunging into the civil war in Syria, Russia — despite the fact that most of its Muslim population is Sunni — entangled itself with the Shiite camp, and can no longer be trusted by the Sunnis. With the United States and Russia no longer able to hold the balance between Iran and Saudi Arabia, China, which has solid relations with both, is increasingly tempted to fill the vacuum. There are several reasons why the Sunni-Shiite divide is of particular concern to China. As home to a large portion of the world's conventional oil reserves, the Persian Gulf region is critically important to the China's resource-intense economy. While the world is currently enjoying extraordinarily low energy prices, this could easily change should the rivalry between Sunnis and Shiites continue to escalate. Shiites may be a minority in the Muslim world as a whole, but in the oil-rich Persian Gulf they comprise a majority. If Iran and Saudi Arabia and its Sunni allies become embroiled in a regional war involving physical damage to oil infrastructure, crude prices would go through the ceiling, to the detriment of the global economy. With half of China's crude imports coming from the Persian Gulf, such a crisis would likely hurt China more than any other major economy. China's desire to cultivate a Middle East without sectarian instability also traces to the hallmark of its foreign policy in the 21st century: the One Belt One Road initiative. This effort to connect the landmass and surrounding waterways stretching from China to the heart of Europe in a network of trade and transportation corridors is crucial to China's efforts to stimulate Asian economic growth and create new markets for Chinese goods and services. China's Belt and Road initiative is the most ambitious economic development project in human history. The Belt and Road initiative is the most ambitious economic development project in human history, to which Beijing has already committed hundreds of billions of dollars. It offers a major mechanism for China to reboot its economy, currently afflicted by slowing growth. Finally, it positions the western Chinese region of Xinjiang as a future gateway to both Central and South Asia. But a restive Middle East stands in the way of all that. Beijing's concern that the Uighurs that have joined the ranks of the Islamic State, which it says numbers in the hundreds, might one day return to cause havoc in western China, disrupting the Belt and Road initiative. 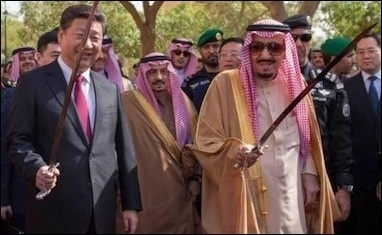 Xi must be seasoned enough to know that Chinese diplomacy, active as it may be, has no chance of overriding centuries of bad blood between Sunnis and Shiites. 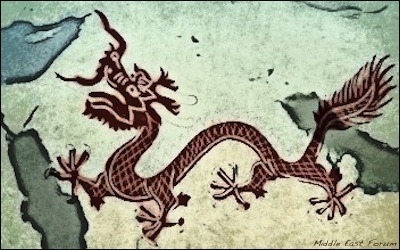 And an inherently atheist Chinese leadership may not even be able to relate to conflicts rooted so deeply in religion. But China can help keep the flames under control. In the absence of diplomatic relations between Riyadh and Tehran, China's open communication with both capitals may become a vital asset. China can use the One Belt One Road initiative as a tension-reduction mechanism, promoting projects that create shared Sunni-Shiite economic interests like the Iran-Pakistan gas pipeline, the port of Gwadar on the coast of the Arabian Sea, and a Silk Road high speed railway connecting Xinjiang and Tehran via the Sunni Muslims countries of Central Asia — Kazakhstan, Uzbekistan, and Turkmenistan. China is positioned to promote Iran's membership in the Shanghai Cooperation Organization, whose other members are predominantly Sunni, a shift possible now that United Nations sanctions against Iran have been removed. All this, of course, will have to be balanced with Chinese overtures to the Sunnis. With its new anti-terrorism law allowing for the Chinese military to stage counter-terrorism operations abroad — albeit with consent from the relevant country — China can become actively involved in the various coalitions formed to defeat the Islamic State as well as in peacekeeping missions. Additionally, as one of the few remaining countries still in the business of building nuclear power plants, China can help ensure that Sunni countries developing civilian nuclear power — an undesirable yet unavoidable response to the Iranian nuclear deal — do so with the safeguards necessary for nuclear non-proliferation. Washington should welcome Xi's advances toward the Middle East. Not everyone will appreciate China's new role in the Middle East, especially those in Washington accustomed to America as sole power broker in the region. But with escalating tensions in the region, and neo-isolationism's spread within the American electorate, Washington should welcome Xi's advances toward the Middle East. His forthcoming spring visit to Obama's Nuclear Security Summit in Washington is a chance to explore how the two powers can jointly manage the region's many pitfalls. Winston Churchill once said, "The price of greatness is responsibility." As China strides into greatness, its readiness to pay that price in the Middle East will soon be tested.